Ridgefield Thrift Shop Holds Bridal Expo on Saturday! 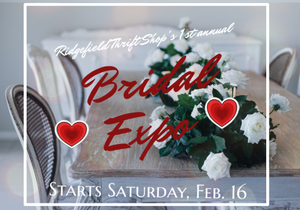 The Ridgefield Thrift Shop invites you to join them for their 1st ever BRIDAL EXPO this Saturday, Feb. 16. "In addition to beautiful gowns and bridal accessories, we'll have everything you need for your bridal table and decor. Some of the finds include wood "Mr." and "Mrs." signs; Waterford champagne glasses; dozens of mercury glass candle votives; new guest books; ring bearer pillows, and much, much more," the Thrift Shop explains. The Ridgefield Thrift Shop is located at 21 Governor Street in downtown Ridgefield. Visit them online here.